For high voltage distribution (>250V DC) to modules, there are special high-voltage connectors SHV that can be used up to approximately 10kV. SHV connectors, compared to other coaxial connectors, have an advantage that it is not possible to confuse them with the usual measuring BNC connectors. Due to usually very good insulating parameters of coaxial cables, it is possible to use coaxial cable RG58 for construction of high-voltage distributions. Signals are led from left to right. 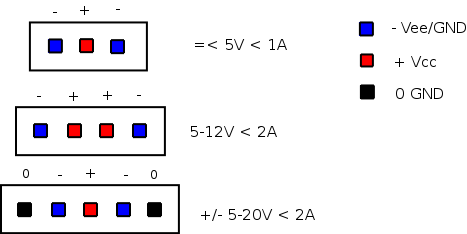 Positive power supply is led from top to the bottom, negative from bottom to the top. Decoupling capacitors are connected with their positive pole to the place they should decouple (if not possible, they are drawn closely to the decoupled circuit). One connection has to contain a minimal amount of connecting points (it is for example not recommended to draw two T nodes, instead it is better to draw one + node). Components’ values must have a common name convention using full names of the physical quantities - e.g. nF, pF etc. A specific feature of MLAB schemes is, that the nails are always in pair, but to keep the scheme intelligible, they are shown as one component (in some cases it requires using own libraries, but on the other hand, schemes are much more intelligible). We advice to use safety serial resistors on inputs of some of our modules (e.g. sensors or often modules working at 3.3V) - they will increase the resistance to extreme preload. Size of such resistors is usually within range 10 Ohm to 1 kOhm, with respect to the IO pin’s current requirements. Almost all the present MLAB modules contain a safety antiparallel diode on the power supply input, serving as a protection against polarity reversal. It short-circuits the power supply in case of connecting the power voltage of incorrect polarity. In order to function correctly, the diode requires power supplies with current limit. Therefore it is not recommended to power supply the modules directly from accumulators, as they are able to damage (evaporate) the diode in case of wrong connecting and thus ruin its function. When using modules together with accumulator or battery power supply, we recommend using a proper power supply module that contains a fuse or a converter with current limitation. MLAB modules are designed in 10.16 mm raster (400 mils) and their sizes exceed 200 mils - 10 mils from the centres of the corner holes. Each module is 10 mils smaller in size compared to the exact raster due to production tolerances (otherwise it might not be possible to fit two modules next to each other on a base board). To make it possible to fit modules next to each other, it is necessary to make each size smaller by 0.254 mm (10 mils). For mounting on the ALBASE, we use M3 screws of 12 mm in length - that is why it is necessary to have four 3 mm diameters openings on each PCB. Screws need to have a sufficiently large space around them in order to fasten two contra-nuts that are holding a screw in a module and at the same time serve as a spacer washer between a PCB and a base. PCB is thus placed at the height of two nuts above the base (approx. 5 mm) making the available space for assembly of components 4.9 mm. In case of using larger components, a module can be slightly raised by inserting a required number of washers between both nuts (usually one or two washers are sufficient, otherwise it is recommended using a spacer column or another nut). Nuts are used thanks to the fact that two nuts make it possible to use a contra-nut effect - they hold firmly and are not released easily compared to simple columns, which have to be secured against release by other ways (e.g. using an anaerobic glue). Conductive traces (??) in PCB and their sizes are always chosen so even an amateur production and PCB mounting are supported as much as possible. Insulating distance are therefore maximal and spaces for components are chosen to be a bit longer than necessary (especially in case of QFN containers, where such approach makes a soldering quality check much easier). The traces are furthermore design to minimise the possibility of modules’ emissions - this usually means to minimise the area of knots (?? Smyček), especially in case of boards with alternating currents of high amplitude (e.g. inverters) or in case of outputs of logical circuits of CMOS and TTL types. In case of two-layer PCBs we prefer to use the upper side of the module (the one away from the base board) as a ground potential (??). If necessary, it is possible to have a low-voltage power supply led also in this side. However, it is quite crucial to avoid leading data or high-frequency signals in the top layer (again, due to possibility of emissions and reduction in the signal integrity). Modules should have all of the four screws connected with the same potential, even in cases when the module is not using the base board’s ground (if there are not any special construction requirements that would make such practice impossible. An exception is for example eth). This practice helps to reduce emissions from modules, especially in cases of multi-layer PCBs. The preferred encasements for components are those from libraries on github verified by us. The preferred size of SMD casing is currently 0805 series. SMD components are placed only at one side of the board - the one turned towards the base board, if possible (B.Cu layer). A reason for this placement is a greater toughness of the construction, lower radiation and easier mounting in a reflow oven. When designing a two-layer PCB, one layer is reserved for grounding and power supply - this layer will be set up as a “Split/Mixed plane” and will have an earth and power supply signals assigned to it. Such setting will allow to automatically end traces of these kinds by a VIA into this layer. It is far better than set up the layer as “copper pour” since in such case the traces are difficult to edit. For power traces, the dimensions of VIAs have to be enlarged depending on the currents, or their number have to be increased. When a module has some free space left of a PCB, it is possible to place a spaces for backup components (usually resistors or condensers in 0850 encasement). During components fitting, it is recommended to use double hřebínek (??) - one raw of pins will be connected to power supply Vcc or ground GND and the opposite pins will lead to backup components, as e.g. ATmegaTQ3201A module. An interesting possibility is to make holes in a PCB at the site of backup components, which will enable an easy control of their presence and furthermore will enable an use of SMD LED. Modules’ indicator LEDs are preferably designed in a way that they shine through the PCB onto the side turned away from the base board. It can be achieved by placing a LED into a hole in a PCB - such kind of mounting is called “reverse mount” and there exist special SMD diodes especially designed for it. Classic THT LEDs with through feet (?? Led s průchozími nožičkami) are fitted together with an assembly washer (?? Montážní podložka) that makes the fitting easier and protects the LED against an unnecessary thermal stress and bending. The washer (??) slightly enlarges the diameter of the LED’s base - which must be taken into consideration during a PCB design. As a basic case for crystals in MLAB modules, we have chosen HC49/S, a small through hole crystal. A reason for this choice was that it can be placed on the top side of the module and its frequency is always visible. Therefore, a constructer always has a good overview about the frequencies used, when working with modules. In case of modules, where we assume occasional exchanges of crystals for crystals with other frequencies, we fit them with a special crystal holder. After shortening the legs, crystals can be comfortably inserted into the holder and thus replaced by another crystal any time. Modules’ indicator LEDs can be of SMD or LED 3 mm types. SMD diodes can be placed also on the bottom side of the board that is turned towards the base plate. In such case, it is recommended to design a hole of approximately 1 mm in diameter over the SMD LED, through which the LED will be visible. Modules’ printings should respect a general typographical rules in order for it to be readable even after an application of screen printing. One module can accommodate more font sizes (usually less than 3 is necessary). They are used in a following order: name of the module, legend, warnings, author’s id. Different sizes are of course used only in cases, when there is enough space on the module. Some modules have therefore only one font size - with respect to a good readability and module’s size. Same priority signals should have the same font size across the whole module. Size and style of individual legends should also united in case of one connector. Legend to individual signals on a pin should be aligned to connector in order to minimise a possibility of line error (?? Řádková chubs) when connecting. Font sizes smaller than 1.3 mm is problematic and it should only be use when there is a very good reason for it. If you have used mlabgen for module generation, QR code should already be created during the creation of the basic directory structure. It will probably be better to use micro QR codes - qrencode utility is able to generate them (e.g. “qrencode –micro -v 4 -s 15 -l L “BATPOWER04C” -o “microQRcode.png””). However, it still does not exist a suitable reader for Android that will be able to recognise them. In order to generate a code for PCB label, Miho created a QR codes generator, which generates ASC formate graphics (originally intended for Mentor Graphics PADS). Size of QR codes on PCBs is so far not unified. When generating codes, the default size is too large for most of PCBs. So far, an acceptable setting has to be tested , e.g. The generated file is found at the bottom of the side as a text. The text has to be manually inserted into a file with asc. suffix. After importing the generated picture into a PCB’s printing, its attribute has to be set as “solid copper” so that the motive will be entirely filled in with colour. QRcode pictures can be added to KiCAD in the same way as logo.